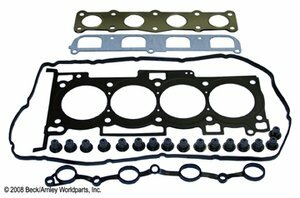 Includes all needed gaskets and sealing components required for a cylinder head job. Includes all needed gaskets and sealing components required for a cylinder head job. Enhancements are used in critical areas to increase durability and reliability. Trust our parts for a long life seal. Engineered to exacting tolerances to enhance fit and optimize sealing performance. Premium materials to maximize service life and durability. Beck/Arnley is a leading specialty provider of premium parts for cars, light trucks, and SUVs. We provide the import parts by model and year to match OE fit, form, and performance. Our product specialists follow a unique research, analysis and procurement process known as Application Specific Sourcing.